Most respondents in Spain have felt the impact of overdue invoices; 22.4% had to postpone payments to their own suppliers and 20.3% reported revenue loss. Survey results highlight only a few changes for Spain in 2018 – the average DSO increased slightly and a faster invoice to cash turn-around was observed. While the proportion of past due B2B invoices is stable, most businesses in Spain reported having been affected by late payment over the past 12 months. In order to manage the impact, suppliers in Spain needed to postpone or default on payments to their suppliers, they needed to take specific measures to correct cash flow and to pursue additional financing. For 20.3% of suppliers, overdue B2B invoices led to revenue loss. The proportion of B2B sales transacted on credit is stable at 37.2% (37.8% in 2017). However, Spanish respondents’ use of credit sales in B2B transactions seems to have declined since 2015. Domestic B2B customers are almost twice as likely to receive credit terms than foreign B2B customers. 46.9% of B2B transactions on credit are domestic and 27.5% are foreign. Spanish respondents are granting trade credit to their domestic B2B customers because they wish to grow their businesses. Moreover, selling on credit is seen as a way to reward loyalty, build trust and attract new customers. The main reasons for not extending credit to their domestic B2B customers were that buyer’s payment behaviour is poor and that the level of economic or political risk is high (both 33.3% of respondents). We grant trade credit to facilitate and increase sales. Companies in Spain mainly grant trade credit to their foreign B2B customers to further open up sales and expand their international activity. Long-term cooperation seems to also influence this decision as it helps build trust and provides insight into the customers’ payment behaviour. Respondents in Spain don’t extend credit to their foreign B2B customers if they lack of information on the customer’s business or payment performance and when the level of economic and political risk in the customer’s country is high (both these reasons were mentioned by 29.0% of respondents). We trade on credit with our foreign B2B customers because they are good customers and pay on time. In 2018, 87.6% of respondents in Spain reported late payments by their B2B customers. This percentage is in line with the regional average and is stable compared to 2017 (when it stood at 87.1%). Payment delays occurred slightly more often with domestic B2B customers than with B2B customers abroad (89.4% versus 85.7%). The proportion of past due B2B invoices in Spain is stable at 43.9% (43.0% in 2017). This is slightly higher than the regional average of 41.8%. The difference between domestic and foreign past due B2B invoices is insignificant: on average, 44.7% of domestic B2B invoices and 43.0% of foreign B2B invoices went past due. The Days Sales Outstanding (DSO) figure in Spain has been decreasing every year since 2015. In 2018 however, it went up to 49 days and is two days longer than in 2017. 57.1% of respondents in Spain do not foresee any changes in their current DSO levels over the next 12 months, however, 19.5% expect an increase and 23.4% foresee a decrease. Over the past year, the average payment terms offered to domestic B2B customers have increased by four days. In 2018, these stand at 51 days. 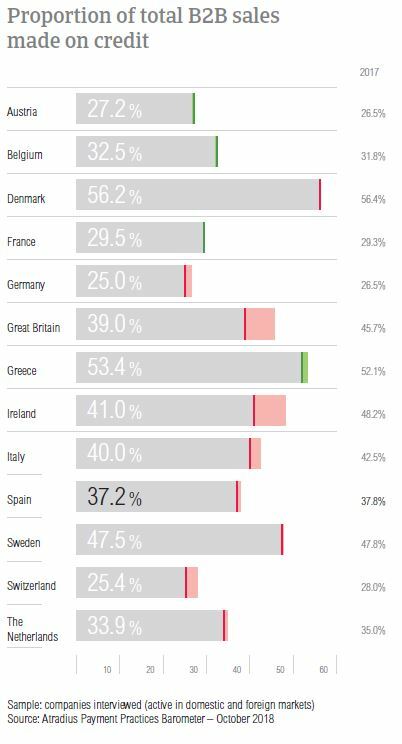 In contrast, the payment terms offered to foreign B2B customers average 39 days (42 days in 2017). When asked whether they differentiate payment terms between domestic and foreign B2B customers, 34.3% of Spanish respondents said that they are more likely to give their domestic B2B customers a longer time to settle invoices. A slightly lower percentage, 32.1% said that they are inclined to give their domestic B2B customers a shorter time for payment. 33.6% said that they would not differentiate payment terms between domestic and foreign customers. The main reasons for differentiating payment terms in Spain are internal policies, the economic situation in the export country and the financial situation related to the export transaction. In 2018, Spanish respondents reported decreases in payment delays. On average, domestic B2B customers paid 25 days late (one day decrease compared to 2017) and foreign B2B customers 23 days late (four day decrease compared to 2017). 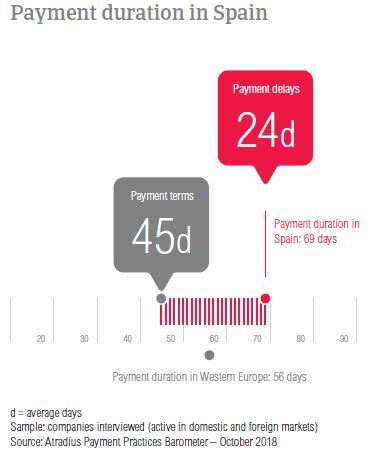 Based on the changes in average payment terms and the decreases reported in regards to payment delays, Spain’s average payment duration dropped to 69 days from 72 days in 2017. Despite the decrease, respondents in Spain still take much longer to convert B2B invoices into cash compared to the 56 days average reported at a regional level. 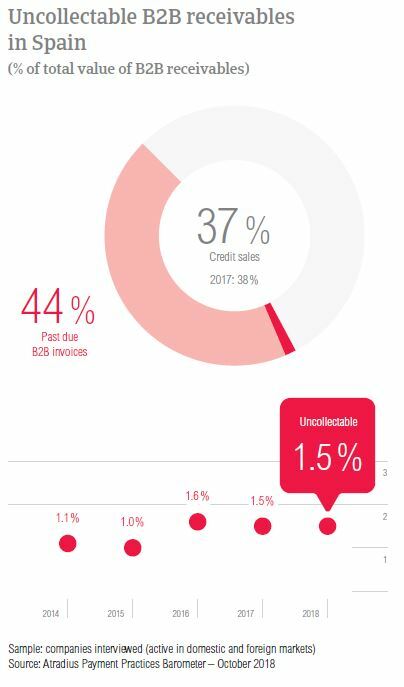 Suppliers in Spain said that their domestic B2B customers delay payments most often due to insufficient availability of funds (mentioned by 45.5%) and buyers using outstanding invoices as a form of financing (34.5%). This latter reason was stated by significantly more respondents than in 2017 and is also above the regional average. Spanish respondents indicated that the main reasons for payment delays by foreign B2B customers in 2018 are the complexity of the payment procedure and the inefficiencies of the banking system (mentioned by 28.9% and 24.0% of respondents respectively). Asked whether overdue B2B invoices affected their businesses over the past 12 months, only 35.4% of Spanish suppliers said that these had no significant impact on their businesses. 22.4% of respondents said that due to overdue invoices, they had to postpone payments to their own suppliers. The second most frequently mentioned consequence was revenue loss, which seems to have impacted 20.3% of respondents in Spain. Spanish businesses are using electronic invoices extensively with their domestic and foreign B2B customers. 70.7% of respondents said that they are already invoicing their customers online and another 13.5% indicated that they will start doing so in 2018. In contrast, 14.4% of respondents said that they are not making use of electronic invoices. 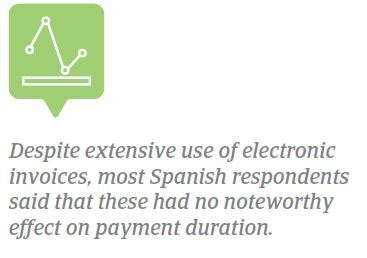 Looking at the effect of e-invoicing on payment duration, 42.2% of respondents in Spain said that they noticed faster payments after invoicing online. On the other hand, 4.8% reported a slowdown. The majority (53.1%) did not notice a noteworthy effect. Spanish respondents have been asked to rank these risks from the most significant to the least significant: US protectionism turning into a trade war, Fed policy becoming misguided, a ‘hard landing’ by China and geopolitical risk. Similarly to their peers in Western Europe, Spanish respondents consider US protectionism turning into a trade war the biggest potential risk to global trade growth. 36.3% of respondents stated this; a lower percentage than that registered at regional level (44.8%). Another 30.2% of respondents agree that US protectionism turning into a trade war is a significant potential risk but not the most significant one. 25.9% of Spanish suppliers rated a ‘hard landing’ by China as the most significant risk. The proportion of B2B receivables reported by Spanish suppliers as being written off as uncollectable (1.5%) has remained consistent with 2017. This is slightly above the regional average of 1.3%. Domestic B2B receivables were written off as uncollectable far more often than foreign B2B receivables (1.3% versus 0.2%). 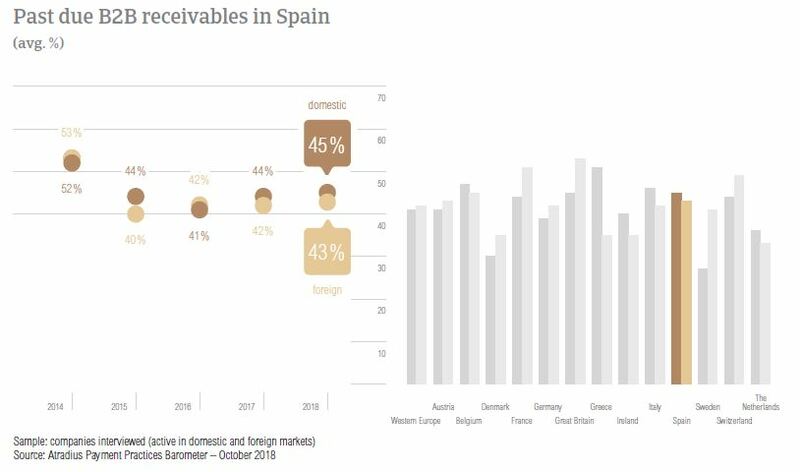 Uncollectable receivables in Spain originated most often from B2B customers in the chemicals, construction, consumer durables, business services and services sectors. Nearly half of the suppliers surveyed in Spain (48.0%) wrote off receivables as uncollectable due to the customers’ bankruptcy. 34.7% of suppliers surveyed wrote off receivables as uncollectable due to the failure of collection attempts while 29.1% said that this was due to the old age of the debt or the high costs of pursuing debtors. While B2B customers in Spain are already given long average payment terms (45 days), B2B customers in the construction and textiles sectors had 70 and 60 days respectively to pay their invoices. In contrast, with 21 days on average, B2B customer in the food sector had the shortest time to fulfil payments. 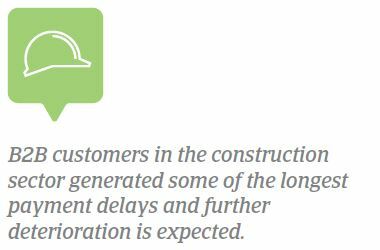 In terms of payment delays by sector, B2B customers in the construction sector and those in consumer durables generated some of the longest delays. B2B customers in the construction sector paid on average, 18 days after the due date and top reasons for delays were insufficient availability of funds and buyers using outstanding invoices as a form of financing. Survey respondents said B2B customers in the consumer durables sector delayed payments, on average by 25 days, and the main reasons were insufficient availability of funds and disputes over the quality of goods delivered. Looking ahead, 42.0% of respondents in the construction sector and 43.0% in the consumer durables sector do not foresee changes in the payment behaviour of their B2B customers. Of those expecting changes in the construction sector, 33.0% foresee deterioration and 26.0% improvement. In contrast, 25.0% of respondents in the consumer durables sector expect deterioration and 32.0% improvement. The impact of potential US tariffs on car and car-part producers would be limited, as the US is not a key market for Spanish OEMs due to their model range.